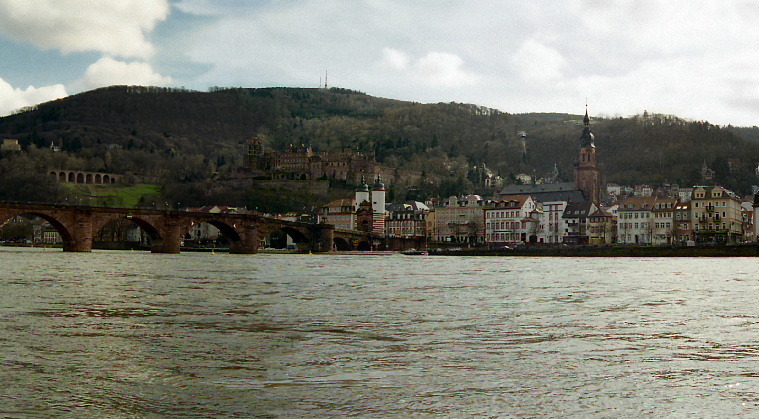 Heidelberg, Frankfurt: This will be my last entry in Germany. The week has again been very rough. Monday, while trying to mail souvenirs to friends, I suffered a flat tire on my Audi. I managed to limp it to the rental car office without damaging the rims, and they swapped it with a tiny Volkswagen Polo that had bad wheel alignment. I didn't like that car at all. I wanted to make a run for Mt. Blanc on the Italy/Swiss/French border this week but all signs were bad. Car troubles, lack of motivation due to mental and emotional exhaustion, changes in my day off, and sickness made it near impossible. Tuesday night I came down with a stomach virus and was up all night. The next day at work I was so cold I was shivering. I’d lost everything I’d eaten in the past day, and my body wasn’t warming itself properly. I was very weak and in constant pain. I went to the hospital and back to my room to sleep it off. From the start, we were waiting for something to happen. Just a few months after the September 11, 2001 attacks on the World Trade Centers, there was a war in Afghanistan, and we never knew if we would be forward deployed to a 'hot spot'. At 2 1/2 months, the decision was made--we would all be redeploying back to our home bases. I prepared to depart, carrying, once again, my 272 pounds of gear, most of which was never needed in the first place. The next day my boss told me he wanted to see me before I left for the states. When I showed up, he then told me I'd done a lousy job. Fair enough--I already knew that, but why let me do a lousy job for 2 1/2 months and not say one word??? He reminded me of my boss at Royal Foods in Evansville in 1984, who didn't like my performance, but didn't say one word for six weeks, was very friendly to me the whole time, like I was his buddy, and then fired me all of a sudden--which was the last straw that prompted me to join the Air Force. If I was lousy, he was a lousy supervisor. But I'd grown very tired of trying to fit in with this group of people who didn't seem to want to talk to anyone who wasn't 'cool'. After repeatedly trying to find my place and asking what needed to be done, I decided I'd sit in my corner and not speak unless spoken to. I spent my last two weeks planning my weekends and doing research on Iraq, which I'd need when I got back to the states. I always shine on TDY's, but I was depressed and lonely when I arrived in Germany and expecting to make some friends. After getting the cold shoulder, I decided I'd disappear and wait for someone to look for me. My boss and I discussed it a bit and parted with good wishes and a hand shake. He admitted that the unit was 'cliche-ish'. 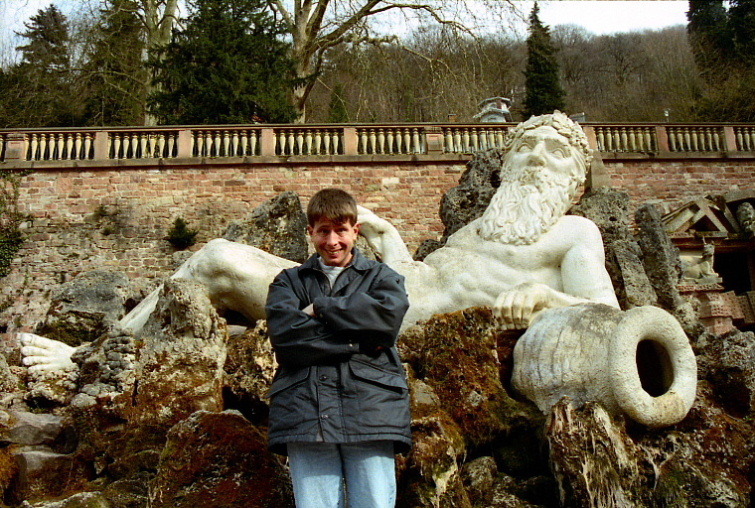 Then I packed my crap and drove to Heidelberg. 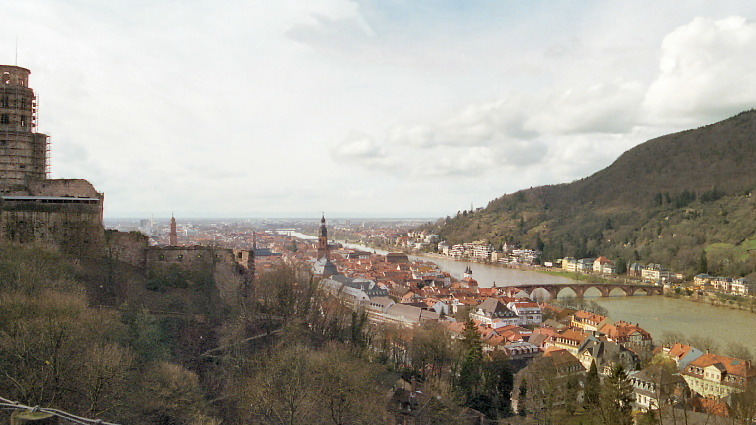 I had to fly out of Frankfurt the next day, so I reserved a room in Frankfurt and visited Heidelberg on the way up there. 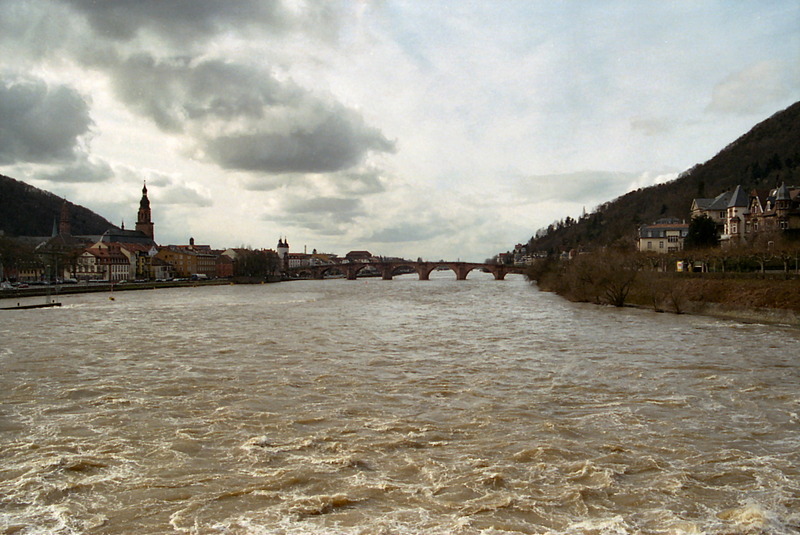 Heidelberg is allegedly the warmest part of Germany, although everything felt cold to me that day. I drove to the top a huge hill outside the city, to an overlook. 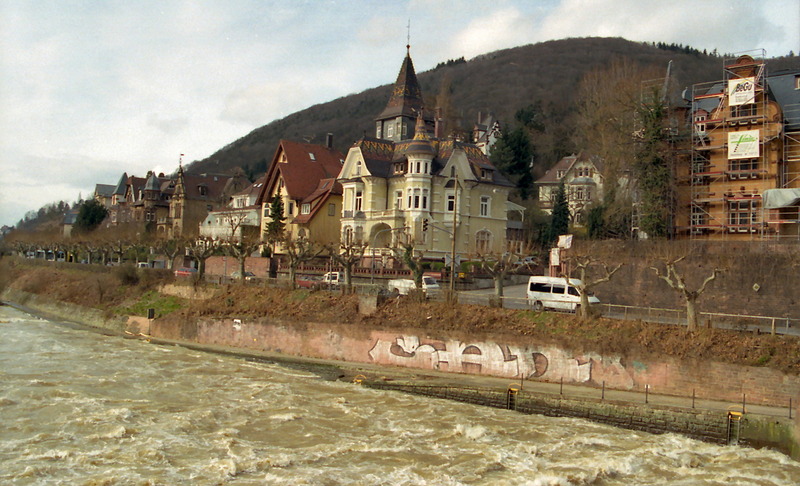 Heidelberg has been a college town since 1386--built in the Neckar River Valley with the huge Heidelberg Castle covering the hillside as if standing guard over this little German town. Heidelberg was simply the most gorgeous town I’d seen in Germany. It was like Salzburg, Austria but smaller. I walked slowly today, thinking about things, trying to pull myself out of my doldrums, and regretting things I’d written to Angie, my dear friend from Malaysia. I'd never met her, but we'd spoken on the phone many times, and out of all of my friends, including those who lived in Virginia and saw me daily, she was the most dependable. Maybe I was a little too 'honest' with her. Europe left me feeling sad, used, and empty. All this beauty around me and emptiness inside. I bought lots of gifts for people, but for myself, a $5 black and white drawing of Jesus as depicted on the Shroud of Turin from 1927, which I keep in my bedroom. I left Virginia feeling very fragile (and it didn't help that I was stood up on my birthday by a Christian woman) and was made to live alone for 2 1/2 months. I did my best to travel and not think about it. It didn't help that no one from Seaford Baptist Church in Virginia answered emails, and my co-workers in Virginia virtually ignored me, and all my postcards to Ha came back 'address unknown', and I learned that my friend Bob Kowolchuk had died. This was the second time I went away alone and had asked my close friends at Seaford to keep in touch, and they didn't. They utterly ignored me. I had to email the associate pastor, Gene, to get the church's address so I could send my tithe, and when I did he replied,"Who is this?". Wow...I just wanted a warm smile and sunshine now, but didn't expect to get it from the frigid people I knew in Virginia, ESPECIALLY my Christian friends. My non-Christian friends were a lot closer to what a friend is supposed to be than those who claimed to follow Christ. 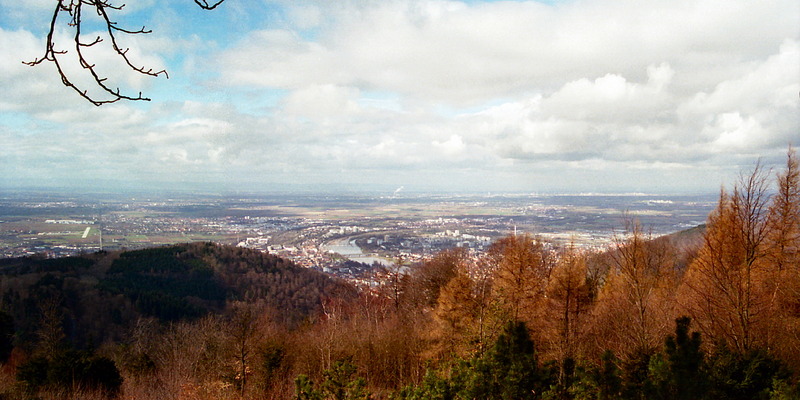 I descended the hill to the Neckar River, parked, and walked for two hours. I crossed the Alte Brucke Bridge, walked along the river and shot photos of the castle on the hill, and the line of decorative townhouses with swans in the background, floating downstream. It was like a dream, and I just hoped my boss in Germany didn't contact my boss in Virginia. I was alone but I wasn't, at that point, in trouble. Still, I wanted to do well in Germany, but I didn't see how. I'd been trying to get some good fowl (swan, duck, Mole-hen, Pterodactyl) photos for weeks. After photographing the hill with the gorgeous castle, while still looking through the camera, I lowered my camera and AHHH!!! 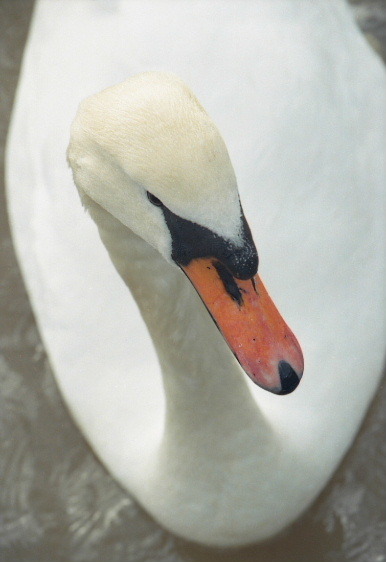 There was a swan in my face! Literally--IN MY FACE! 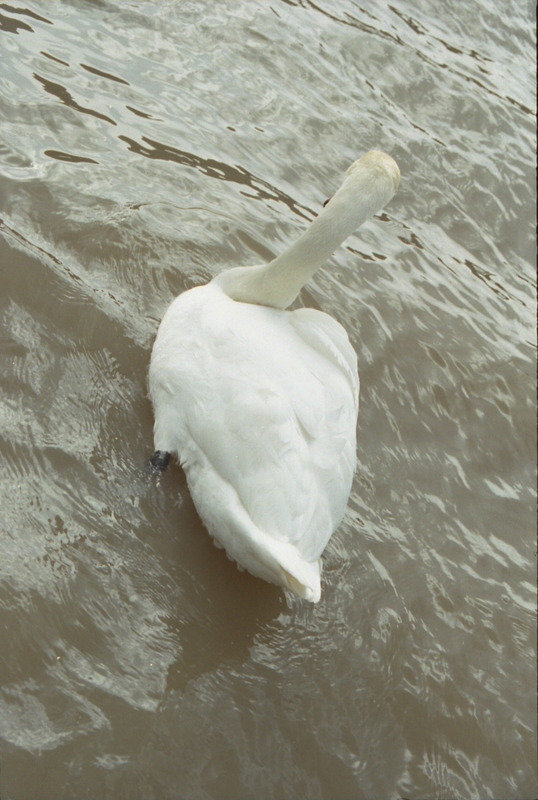 He’d (or she’d--couldn’t tell…the goodies were underwater) swum to the shore and was floating bill-to-knee with me. I thought it was going to attack me, but it just sat there and looked at me. I thought it might need some Grey Poupon, and I didn't have any. 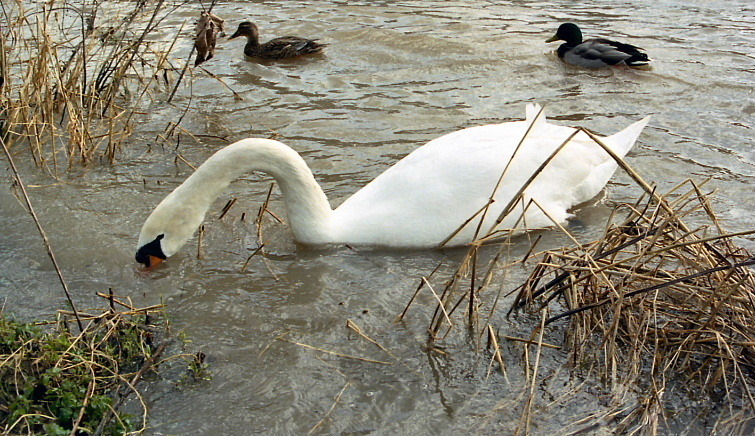 Its fellow swan, and two little ducks came behind. It was so wonderful that I almost felt like God was telling me,” It’s okay Michael you dumbass--I know you’re an idiot but I still love you”. 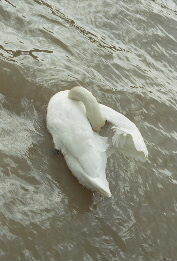 I followed, photographed and hand-fed the swans grass from along the river. When I got a little too close, they hissed at me. It was a lovely surprise. All the castles and bridges in the world combined can’t match the beauty of God’s gentle living creatures. 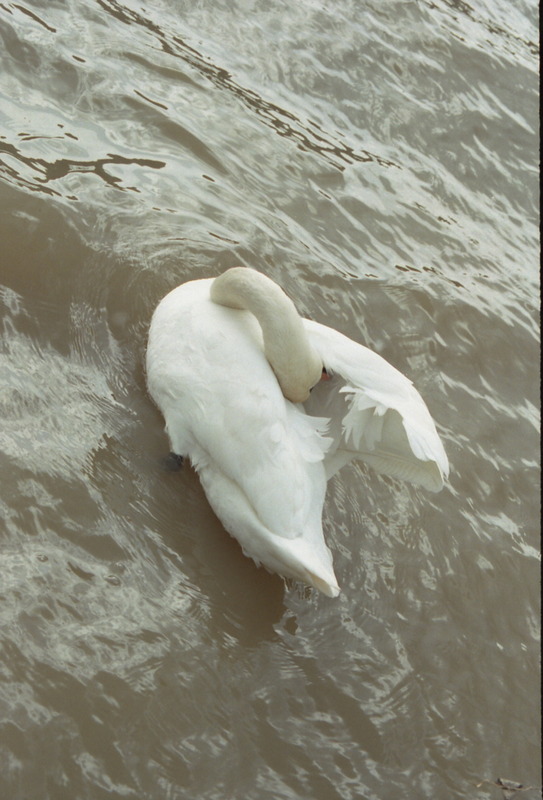 And swan tastes so good too. Germany was so beautiful everywhere I looked. After the swan incident, I crossed the Alte Brucke bridge again, found a walkway up to the castle, and climbed the 200-foot hill. The earliest castle structure was built before AD 1214 and later expanded into two castles around 1294; however, in 1537, a lightning destroyed the upper castle. 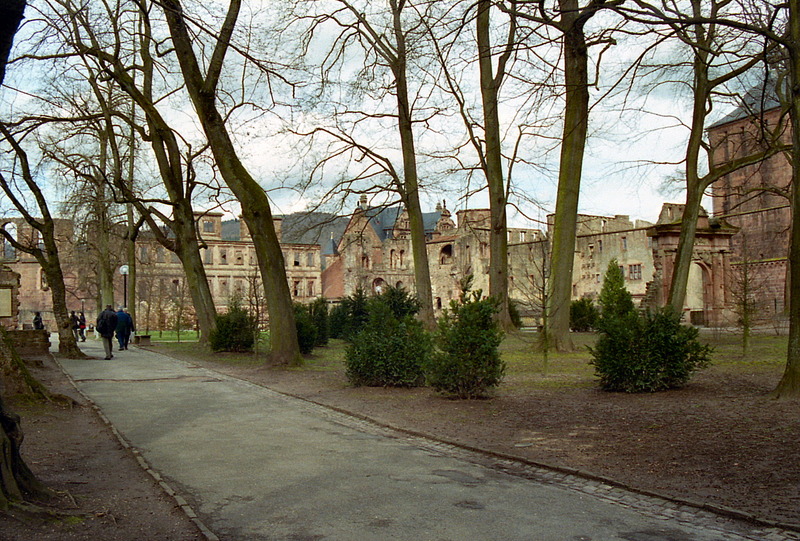 The present structures had been expanded by 1650, before damage by later wars and fires. In 1764, another lightning hit destroyed some rebuilt sections. At the top of the hill was Gun Park, a large park adjacent to the castle, built on a Romanesque overlook and containing some sculptures. 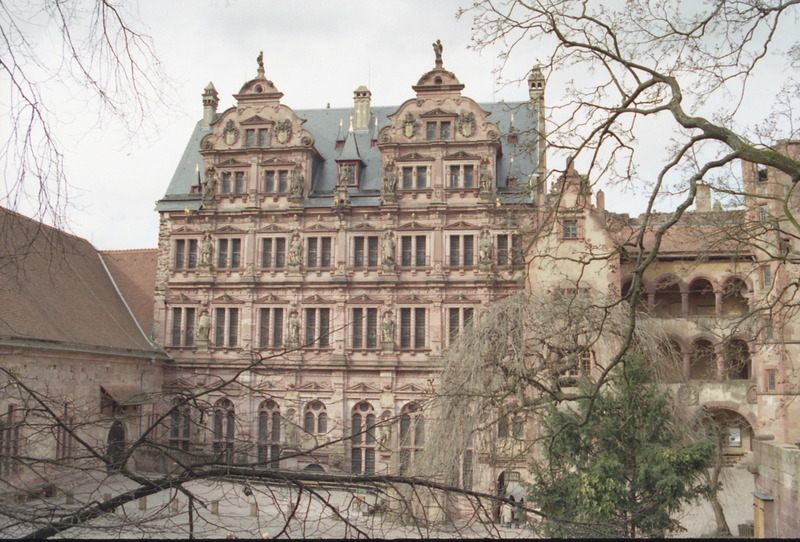 The Heidelberg Castle is one of the best preserved I’ve seen, next to the one in Disney World. 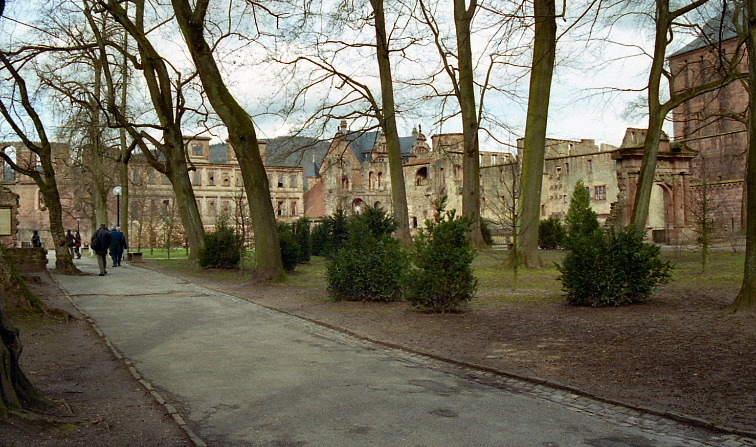 There are small castles all over the place in Germany, and most are burned-out stone shells, as the one in Frankenstein, but some are well preserved. 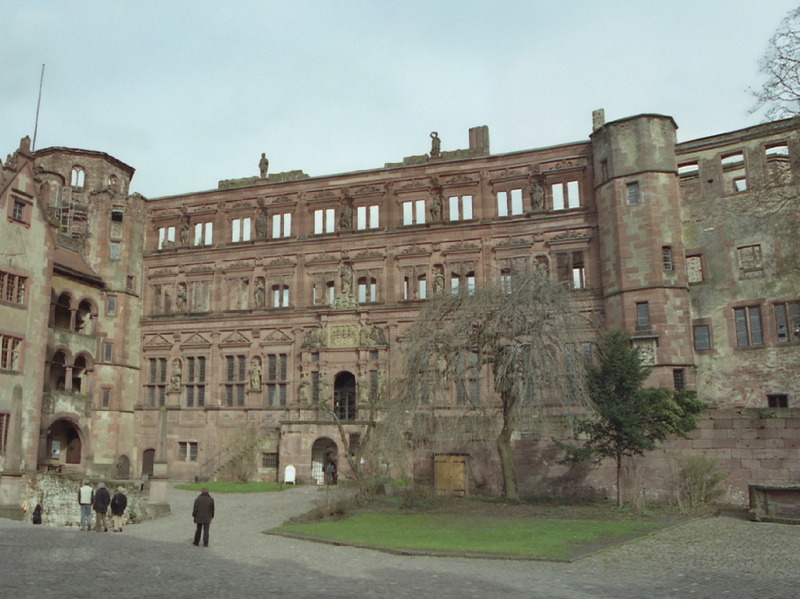 The Heidelberg Castle was badly bombed by the French in the 17th century, but held up well. 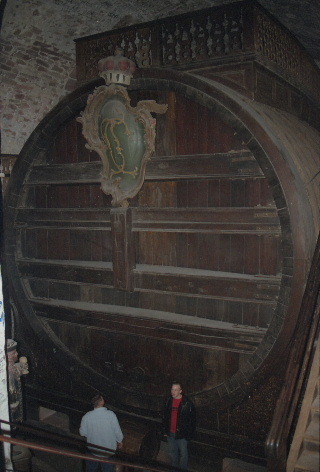 I went inside where I saw the largest beer keg I’d ever seen in my life--55,000 gallons of beer. At my current average, it would take me about 4583 years to drink that. Don't ever judge a party by how many kegs are available! This was definitely worth the drive. I always wonder how these tiny little towns get such a tourist showing worldwide? Maybe it’s pride. Even the smallest towns here radiate pride in appearance. You don’t need a lot of buildings to have something worth seeing or preserving. I have complained and been critical of Germany and most of Europe for the past 75 days (it’s my nature) but acre-for-acre, Germany is the most beautiful place I’ve every seen. It’s not home, but home doesn't want me back now do they? I told the taxi driver in Frankfurt than no matter how beautiful a country is, it will never be as lovely as home. Where is my home? I didn’t know--I’d been trying to find it for 36 years. I had a relaxing stay at a motel in the Frankfurt Airport and I flew out of Frankfurt the next morning. Maybe my home is in the heart of the one who loves me. I’ll keep looking. I just shot a lot of photos and enjoyed the view.